Fantastically located in the delightful harbour village of St Aubin, Porthole Suites are spacious, contemporary and luxurious. Fantastically located in the delightful harbour village of St Aubin, Porthole Suites are spacious, contemporary and luxurious. The setting is ultimately peaceful with a large secluded terraced garden to relax at the back and lovely views over St Aubin's Bay from some of the suites. Arrival and departure is available on any day. There is a minimum stay requirement of 3 nights throughout the year, except between 2nd June and 31st August when a minimum stay of 4 nights is required. The Porthole Suites have a choice of Classic and Ground Floor Deluxe Suites. Graded four star by the AA the Suites are fully equipped and serviced. All Suites are studios. Classic Suites are mostly suited to couples, but can accommodate a child under 14 years on the sofa bed. Deluxe Suites are larger with baths as well as large walk in showers and can accommodate a family of four. Porthole Suites are a couple of minutes walk away from a small supermarket and from many lovely restaurants, pubs and bars. The island is proud of the many dining opportunities it offers. Of course in St Helier but also along the sandy St Brelade's Bay, where seafood, a pizza or a cocktail can be enjoyed while watching the world go by. Walking or cycling the sea front promenade towards "town"or the Railway Walk to the magnificent Corbiere Lighthouse on the west coast are amongst the few activities that spring to mind when staying in St Aubin. Water sports are readily available from the three nearby bays: St Aubin, St Brelade and St Ouen. The island's past is of course also well worth discovering - maybe start by taking a tour of Elisabeth Castle, visible from the Suites. The Suites are not suitable for wheelchair access. Location is all! St Aubin is most islanders' favourite spot for an afternoon stroll or an evening out. A few little and independent shops add to the pleasure. An excellent bus route will take you to the central bus station, to and from the airport and of course to and from the beach. Check-in time is guaranteed from 3pm however if you expect to arrive earlier, please let us know when you book and they will endeavour to prepare the room earlier. Check-out time is 10am. Alex was very hospitable and made us feel welcome immediately. The apartments are immaculate and very well equipped. We are hoping to return during the summer. Beautiful appartments, very well appointed and in an excellent location in the centre of St Aubin. Warm welcome from Alex...modern, fresh, clean suite...in an excellent location. Lovely accommodation looked after very well. Would recommend to others. EXCELLENT, GOOD FOOD, FRIENDLY, JOHN VERY HELPFUL, THE PARKING A LITTLE BIT TIGHT AT TIMES.OVERHALL VERY GOOD WOULD STAY THERE AGAIN. 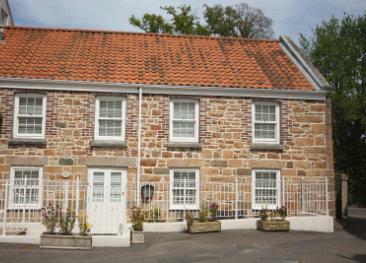 Very comfortable Guest House in a good, elevated position overlooking St. Aubin harbour. Superb breakfasts set you up for the day. There is car parking available, but the local bus stop is nearby and a very good service. Hope to return. Exceptionally clean, comfortable and friendly. La Haule Manor is a beautiful property with stunning views over St Aubin’s bay. It offers a mixture of self-catering apartments and guests rooms furnished to luxurious standards. 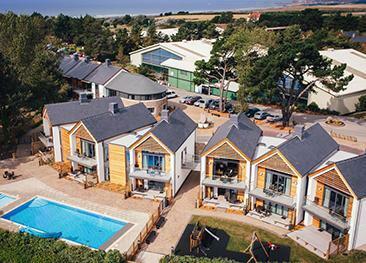 Within easy reach of Jersey's west coast and close to some of the island's best beaches and stunning countryside, Les Ormes is the ideal destination for fun-filled active holidays as well as relaxing breaks. 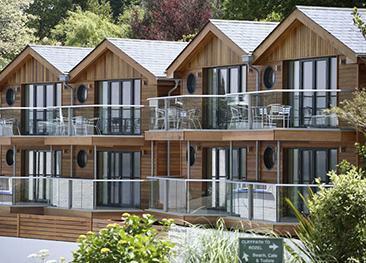 The Water's Edge Chalets are situated in the heart of Bouley Bay on Jersey’s north coast, with views across to the French coastline.